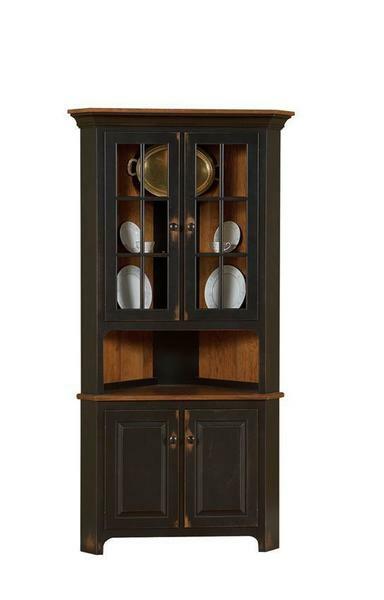 The Amish Plymouth Corner Hutch possesses a brilliant, rustic contrast between it's hand-rubbed black finish, naturally finished counter top, and solid wood back paneling. The corner hutch has a very functional and space saving design that is great for any room with unused corners. The triangle shaped frame fits snugly into any corner and provides plenty of extra storage while taking up very little floor space. Incorporate this Plymouth Corner Hutch into your home furniture collection and gain a stylish accent piece in addition to the ample amount of extra storage and display area for your everyday household essentials. The durable and top-quality design of this stunning corner hutch is completely handcrafted by our highly dedicated and skilled Amish woodworkers. Each hutch is custom built to order in their wood shops right here in the heart of the United States. For more information or custom ordering assistance on this handcrafted Amish Plymouth Corner Hutch, contact one of our talented Amish furniture specialists. Height from Buffet Top to Bottom of Hutch Top: 12 1/4"